A step-by-step guide, with best practices! Yup. Blog posts about Amazon KDP Select free promo days are as common as bad drivers on I84. But I want to do something a little different here. I want to lay out steps and include details about why they are important. I’ll also give you a basic overview of boosting posts on Facebook. These days it’s best to spend five bucks to get the word out. 1) Decide why you’re doing the KDP Select free promotion days. Don’t just do it to see what happens. I can tell you what happens. Lots of people download your book and add it to their vast library. That plus $17 will buy you a coffee. You want the reader to buy the next book in the series. Provide a sample of the next book in the back of the book you’ll be promoting. Provide a link to buy the next book too. If you haven’t done this already, it’s a good idea. You want the reader to buy another book you wrote that is not in the series. Same as above. You want newsletter sign-ups. Definitely recommended if you don’t have any other books available to buy, because this way you minimize the risk of losing them before your next book comes out. People forget things. Even authors they enjoy. For your first promo I don’t believe you should shoot for more than one of the above goals. Why? It’s hard enough to track progress on one front, much less several. You can always adjust your tactics for the next free promo. Once you’ve chosen your general goal, choose a specific one. Are you going for sales of the next book in the series? Great! How many do you want to sell? Just guess. Set a goal and be ready for failure or success. Both can be daunting, but it’s essential to measuring the success of your effort. 2) Decide how many days you want the free promo to run. I suggest a minimum of two. This way you can spot whether downloads are accelerating over a substantial period of time (implying a hunger for your book and/or wise choices on the marketing front) or not (implying you’ve missed the mark on marketing). My opinion is that five days is too long. Especially if this is your only book. Why is that? Because free promo days are a great way to get people to give you a try. If you don’t have another book to sell them then you’ve lost them. Also, five days is too long because you don’t want everyone who WOULD download your book to see it and download it. You want to leave some room for word of mouth to set in. The longer you keep the book free, the more likely you are to exhaust your potential audience in one go. Now, if you want to just get maximum exposure then five days is an option. Just don’t expect too many sales after the five days is over. 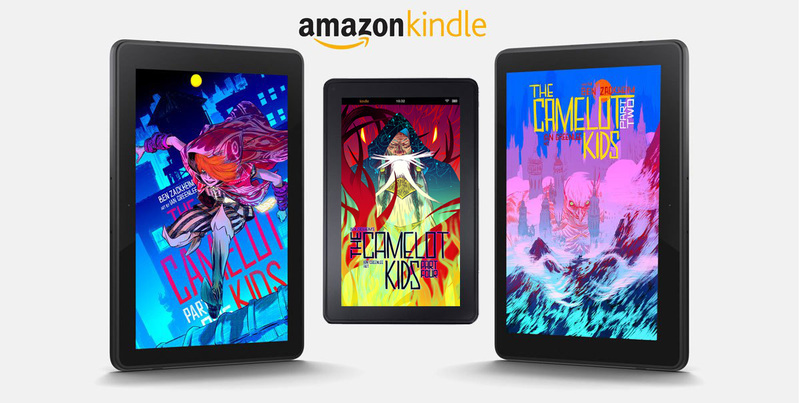 You’ve gotten on their Kindle, and now you have to hope they convert to other books in the series or other titles you’ve written. So first, choose one of these sites to buy a guaranteed spot. These are the top-notch options for your free day advertising. Choose one, secure a date, and then choose more from this category if you can afford it, and if they can accommodate your dates. Bookbub is tough to get on. They may turn down your money. But one or two of these sites will be happy to take that heavy dough off your hands. I’ve had an especially impressive result from Manybooks. Shirley Link & The Safe Case hit the top 500 Free list on Amazon and it took four days to settle down. Highly recommended. 4) Make a list of friends you can count on to share and bug ’em. Prep an email to them. You’ll send it out a day or two before the promo. I apologize for the group email but I want to reach as many people as possible for this. I’ll be giving my ebook [book name] away for FREE on [date]! Why free? It’s a limited time deal on Amazon that will expand my readership and give me a chance to find some new fans. I could use your help on the promo day. Please keep an eye on [Facebook, Twitter]. When you see my announcement, please Like and Share. The sharing part is important since it will help more people see the deal. That’s it! I appreciate any help you can provide to get the word out. I’ll let you know how it goes! You can also use the Author Marketing Club tool to submit. The tool is a little wonky but it works. 6) Now head in and set your free days on Amazon’s KDP Select site. 7) Now go to your social networks of choice. Twitter. If you have a Twitter Ads account then you can schedule tweets to go out whenever you want. If you don’t have a Twitter Ads account, it’s worth it. It’s free and gives you incredible stats and some useful features. Sign up for Twitter Ads here. (it’s a Twitter-owned service) Some people use Hootsuite or Buffer to queue up their tweets for later. Both are excellent options. Set up seven tweets per day of your promo. Don’t make them all sales pitches. Make them intriguing. Ask a compelling question that your book answers (fiction or non-fiction). Include every media you have for your book! I recommend you buy some ads on Twitter Ads to get the word out. But wait until the next promo. For your first promo, give Facebook some hard-earned cash. They’re getting good at delivering readers to me. Facebook. Do two posts for each day of the promo. Again, set these posts up ahead of time. You should consider boosting your posts with a $5 spend. It increases awareness of your promo. Just make sure you target correctly and set the post date for the promo date. How do you do that? It’s easy. Draft your post (please include an image of the book cover to make the post appear nice). Then click on the Boost Post button at the bottom of the post window. Notice the elegant layout. Amazing how Facebook can make great interfaces when money’s involved, huh? NOTE: Facebook changes their design all the time. The boosting process will always be similar, though. 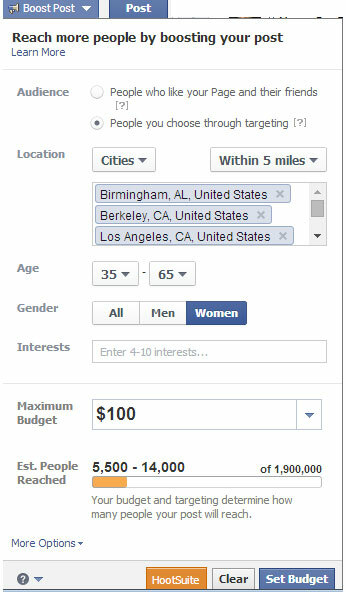 Just select “People you choose through targeting” to get the range of options you’ll need. Then fill out information that you think appeals to your target audience. The Interests window is especially important. Put words in there that relate to your genre and book. So if you wrote a book inspired by “It” you could enter “horror, stephen king, violent, scary clowns, it.” Yes, you can get as specific as you’d like. The more specific, the better. With these data in place a whole slew of people who are interested in King, It, and scary clowns will get your ad served to their page. Some people don’t get great results with Boosts and prefer running Facebook ads. These show up as promoted posts in the feeds of people who you target. The process of setting up an ad is more complex, but you can get the lowdown on how to do it here. If you want to take a course in Facebook ads, sign up for this course. Pinterest. Post your cover art, interior art and marketing images. The copy should tout the free promo days. 7.1) Add a keyword. Thanks to Julia Derek in the comments section, you get this excellent tip. A couple of days before the promo, head into KDP and add the term “free ebook” to the book’s keywords. It will take several hours to a couple of days to go live. This should help people find you if they’re looking for free ebooks. Don’t forget to remove the keyword term after the promo is over, though. 8) On the first morning of your KDP Select free promotion days, monitor! Go to your marketing journal and see which sites you informed of the free days. Did they post the promo? Not all of them will. Be aware that some sites will post at the end of your day (it’s a big world!) Take note of which ones posted. You’ll want to have that list handy for the next promo. Go to the site(s) where you paid for promotion and make sure you got what you paid for. Post the deal to these promotional sites. They only accept additions on the day of the promo. Send out an email to your friends, reminding them and offering some new details/news that will make the email worth a read. As I mentioned, my ebook is free for today on Amazon! Please share the post on your timeline. If you don’t see it, here’s the url. Thanks so much! I checked my dashboard and have [number] downloads so far. So excited. If you’re happy with the results you can post about your success on social networks. It might be nice to send a final email with the good news if you feel like that’s a good idea. And, of course, head to Amazon KDP to check on the progress. Watch the downloads roll in! It’s fun. Don’t forget to eat. 9) If downloads accelerate on day two, consider adding another day to your promo. Increased interest in your book over a 48 hour period may be a sign that you’ve broken through to a larger audience than your genre warrants. In other words you may have broken into Amazon’s “mainstream” a little bit. If this happens then adding a day will allow for you to capture a much wider audience. Ideally, you’ll go back to charging for the book right when the interest peaks. This way you’ll pick up sales from people who were interested enough to pay for your book. 10) Was it a success? You should keep promoting for a few days after the promo is over. Tout your rise in the rankings, new reviews or whatever stands out as a positive result. But also evaluate the performance of your campaign. Remember how you set a specific goal for your promo? Did you meet it? Exceed it? Give the readers a couple of weeks to show their intent. It takes a while to read a book for some of us! Take a realistic look at your results. Gauge what went right and wrong with the promo (you will see what worked and what failed). Write these down. Don’t assume you’ll remember because you might not, which means you learned nothing. With all this data, draft a plan for the next promo. And congratulations! You’re on the road to getting much better and being more comfy with marketing! No small task, friends. Let me know how your promo goes. Amazon has a bridge to sell ya! The $1.1 Million question: Is KDP Select worth it? Thanks for some very concrete marketing tips! Seems like a number of these things would apply to release-day promotions, too. Actually, you’re right. It’s funny how I sometimes segment marketing efforts in my head. I’ll have to think about that for a new post. Good tips. I tried KDP Select two years ago, but ultimately decided wide distribution is best for me. Out of all the advertising services, BookBub will get you the best results by far, but it’s hard to get approval. Thanks James. I’d love to hear which distribution channels you chose and more about your book. I’m always curious what factors make authors choose to go wide. It’s a lot of work, even with Smashwords to pick up some slack. I’ve done it with the first two books in my series but see very little sales from anything outside Amazon. I use Smashwords, also, and sell pretty well on B&N and Apple. I’ve avoided KDP Select because of the exclusivity requirement. What helps me the most is having a variety of short stories as e-books on Smashwords, also (some free, some $0.99). The shorter e-books are like breadcrumbs that help lead toward my novels. The more the works you have in rotation, the more the sales, I believe. I have a blog entitled “50 Reasons Why My Debut Novel Sold 10,000 Copies” you might want to check out. Excellent information! Thanks so much for sharing. I’m headed to your blog now. Such a great way to break it down. I’m doing something similar with a class I teach. While selling books is an ongoing, lifetime task it’s still good to give people a sense of what to expect in different stages. Holy cow, Ben, this post is excellent! Thanks so much for this. Awesome info. Thanks for writing it! Oh, and I wanted to add that you can also include tags like “free ebook” and stuff like that in the tags on your book details page. That should help even more people find your free ebook during the promotion. Excellent point re: “free ebook”! I’m going to add that (and give you credit, of course). Have a question: I’ve booked a virtual book tour for my book that I self published on Amazon and I have kdp select. It starts in about two weeks. I want to use two of my free promo days and want it to coincide with the tour. If so, when should I have those free days? Also, where else should I announce that I’m doing the free days? It’s wise to maximize visibility of your promotions 100% of the time. Of course, the more you can build momentum the better. That sometimes means scheduling events in succession as opposed to the same time. BUT a blog tour needs a hook of some kind to catch on. A contest. A sale. Something to drive interest toward the buy page. Before I can answer your question fully, Carrie, do you have one book in your arsenal? Or do you have multiple titles? Be sure to read the whole thing as it includes a method of posting your promotion free (it just takes more work on your part). I’ve booked a book tour, I have the tour scheduled, and now I want to know whether or not it’s smart to offer free days at the same time, and if so, when. The middle of the tour? end? a day here and a day there? Or should I wait with that and do it afterwards? The tour has Amazon gift cards for a nice chunk of change. Hi Callie. Generally speaking, you should run a blog tour with giveaways or deals. The gift cards will do well for you! The ONE hesitation I have about using your Free days to coincide with the tour is that you may get a lot of downloaders but it won’t lead to a lot of actual sales. However, if you have other books in your arsenal that the free book can upsell to then it may get you some sales, assuming folks actually read the free book that they downloaded. It may be a good idea to choose one of the blogs as the Free day beneficiary, if possible. You can tell them that you’re making the book free to celebrate your book being on their site. Sure, the book will be free for everyone but the blog’s readers will still feel special. Does that make sense? It does make sense, but I’m still not sure, because there’s a flip side. If I announce a couple of free days at the end of the tour, then people on the tour won’t buy, because they will wait for the free days, and then they will forget about it, and I’ll end up losing on both ends. I see. If you’re main goal here is to get a load of downloads then, yes, you should definitely run the Free promotion during the entire tour, if possible. This will likely create a sustained flow of downloaders. If the entire tour is not possible then I’d make it run toward the start of the blog tour. This way, as the blog tour winds down the traffic will be sent to the book’s page where actual sales may happen. Thanks! Good advice! I will do that. Good luck! Let us know how it goes. Thanks so much for reading! And good luck with your book. Thanks Michael! The link has been changed. Thank you for sharing your advices. There`s a service for ebook promotion. Books Butterfly does $0.99 book and free book promotions to email lists of 125,000+ email subscribers. We have 128,888+ daily active readers. We offer a prorated refund in case a promotion does not hit the specified targets. We’d really appreciate it if you’d add our site to your lists of useful resources. Thank you for the detailed advice with pictures! I have never run a free promotion and want to do it effectively. You’re welcome, Kylie. Good luck with your promotion. This was great. Everything I’ve been all over the net looking for, in one concise, no-nonsense article. I will follow it like a doctor’s prescription for my upcoming first book promo. Anyone have an opinion about the wisdom of posting a free day on Black Friday? HA! Great, thanks Jean. Black Friday is a tough time to snag attention but there’s nothing wrong with trying it out. It would help to shell out some $ for promotion. As long as you have a second book to upsell to, well, it’s worth a try!